New Zealand and Australia men will play a tie-breaker to decide the last team to qualify for the semi-finals following the ninth session of play of the Pacific-Asia Curling Championships 2014 being held in the Karuizawa Ice Park Curling Hall in Karuizawa, Japan. With China, Japan and Korea men and women already qualified for the semi-finals, this session concluded the men’s round-robin. 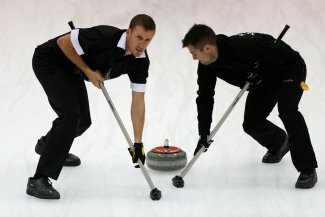 New Zealand defeated Kazakhstan 9-1 after nine ends of play while Australia lost 9-3 to Japan after eight ends of play. This left both teams with two wins and four losses, the same as Chinese Taipei. However, as all three teams had one win against one another: Chinese Taipei defeating New Zealand, Australia beating Chinese Taipei and New Zealand winning their game against Australia, the deciding factor became the draw shot challenge average from the round-robin. Chinese Taipei had the poorest average of the three, therefore they were eliminated from the competition. As a result, Australia and New Zealand will now play in a tie-breaker at 19:00 this evening, with the winner going on to play Japan in the semi-finals. The other men’s game of this session saw Korea and China go head to head as both teams looked for the one win advantage going into their semi-final against one another tomorrow. In the first end of this game, Korea skip Soo Hyuk Kim made two runbacks with both of his stones, the last giving his team two points. China skip Jialiang Zang then drew into the four foot ring to score two points in the second end. It wasn’t until the fourth end that Korea took their first big advantage. This was however thanks to a China mistake as their skip Jialaing Zang wrecked on a guard with his final stone to give up a steal of four points. This made the score 7-2 to Korea but China forced their way back into the game. China skip Jialiang Zang drew into the house for two points in the fifth end before they managed to steal a single point in the sixth end when the Korean skip was light with his final draw into the house. China eventually drew level in the ninth end. In this end, Korea skip Soo Hyuk Kim failed with an attempted raise takeout to give China a steal of three points to make the score 8-8. The Korean skip did hold his nerve in the tenth end and drew into the house with his last stone to take the one point needed for their 9-8 victory. In the women’s competition, China defeated Australia 9-6 while Japan beat New Zealand 7-4, both wins coming as the winners ran their opponents out of stones in the tenth end. These results left both Australia with one win and six losses and New Zealand with no wins and seven losses. With both teams going head to head in the final session of play, a win for Australia will guarantee a semi-final series against Korea, while a win for New Zealand would set up a tie-breaker with Australia to determine that last semi-final spot. The tenth session of play will see the women’s round-robin conclude with China v Korea (WCTV webstream) and Australia v New Zealand, all at 14:00 local time (JST).